Meet Meghan Cooper, a 23-year-old native of Prospect (don’t know where that is? Think Fort Knox, just before you cross over the Penobscot Narrows Bridge and Observatory on your way to Bucksport). This past week she found out that she is officially the 100th ever Island Institute Island Fellow. The Island Fellows Program, inspired by the Peace Corps and now celebrating its 15th year, places recent college graduates in yearlong residential programs on far-flung Maine islands with the mission of bringing support and expertise to island communities. 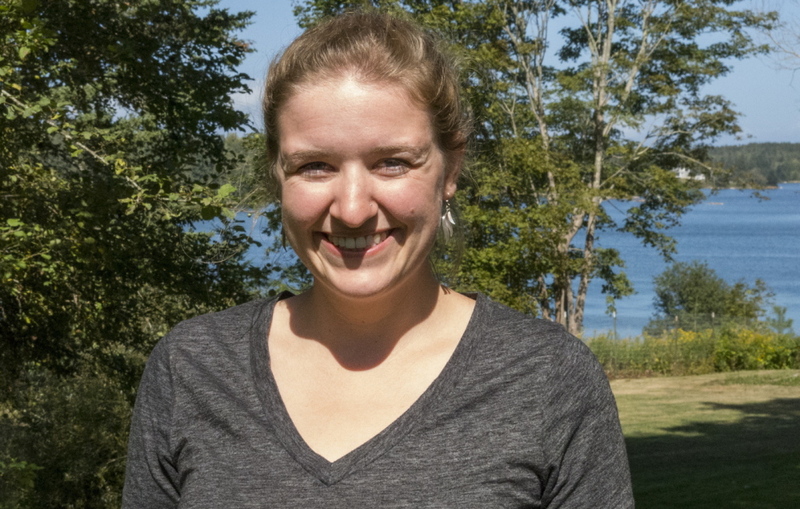 We called her up to find out what exactly that means, how a Vassar College graduate who majored in Russian and history intends to help sustain island life in Maine and how life on Isle au Haut, Maine, and Baku, Azerbaijan, can be connected. Yes, you read that right. That would be the capital of the country in the former Soviet Union, just north of Iran. AREN’T YOU THE WOMAN? Cooper spent her first year after Vassar as a Fulbright scholar in Azerbaijan. This inspired us to hum some Paul Simon to her, namely a line from the song “I Know What I Know”: “Aren’t you the woman who was recently given a Fulbright?” She laughed politely and said “No, I don’t know that song.” (But she did know who Paul Simon is. Unless she was pretending.) She spent her Fulbright year as an English teaching assistant in a school in Baku. A week after she returned, she went out to Isle au Haut to interview for this fellowship. SUSTAINABLE ISLAND LIVING: Asked to assess year-round island living so far, Cooper said, “It’s got huge benefits and huge challenges.” The wind does make it colder. Fishing is the obvious profession, but not everybody can do that. Telecommuting helps. “You have to be creative with your career on a lot of these islands,” she said. “We have a lot of very talented people out here who paint, who write, who do all sorts of things,” she said. Shall we assume that Black Dinah Chocolatiers, open 7 days a week, year round, is included in the benefits? Yes, but Cooper swears she doesn’t go every week. 100 IS NOT THE LONELIEST NUMBER: Some of her friends from Vassar did say, “You’re moving where?” The Island Institute warns applicants to the fellowship program that flexibility is key: “Ferries are missed, weather cancels trips to the mainland and ‘island time’ really does exist.” They should be prepared for everything from being volunteer firemen to playing music at town events. They get housing and a stipend of $15,000. Is it lonely out there for Cooper and her fellow fellows? “We get together every now and then,” she said. “Sometimes we go to the different islands or meet on the mainland, and when we aren’t seeing each other in person we have virtual video check-ins. We are well supported.” More than a third of the Island Institute’s former fellows still live in island or remote coastal communities in Maine. Many stay for a second year of their fellowships. Could Cooper hack it, long term? Her best guess is she’ll head to graduate school eventually, but then maybe come back to island time. “It’s definitely a possibility,” she said.